The in basket: While sitting in a car on the car deck of the ferry Spokane July 3, I looked up and saw the odd repair shown in the accompanying photo. It looked like the repair was made with cardboard and duct tape. I asked what I was seeing. 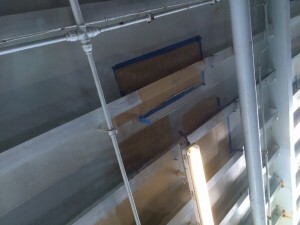 The out basket: Hadley Rodero, a consultant with Washington State Ferries, replied, “The patches you saw are a primer coat that was put in place after a welding repair. The tan is the primer and the blue is painters tape. The in basket: Russell Johnson wrote, “Why are there speed bumps in 35 mph zones that are rated by the county as 10 mph? This doesn’t make a lot of sense. Why isn’t the speed at these areas 10 mph or the speed bump made to be rated at the road speed? “You can find this in other forms all over the county and it isn’t always in a 35 mph zone. At the Point No Point Road (in North Kitsap) the speed is 15 mph and the bumps are 5 mph. What happens when someone hits these at the legal speed and not the warning speed posted by or ahead of these speed bumps? Who would fix the damage, if any would occur as hitting the bump way too fast? “I would also like to know what is the speed (limit) between the speed bumps,” he said. The out basket: The speed limit between any pair of speed humps is what was stated on the last black-on-white speed limit sign the driver sees before the humps. The black-on-orange or yellow signs preceding the humps are advisory. You’re free to cross them at the posted speed if you dare and don’t mind the jolt. The whole idea of speed humps is to discourage drivers from going over the speed limit. If the safe speed to cross the humps was the speed limit leading to them, they’d serve no purpose. A person who ignores the advisory sign and damages his car on the speed hump is free to submit a claim to whichever government owns the road, but I wouldn’t expect such a claim to succeed. The driver would have been warned what the advisable speed is. I e-mailed Mr. Johnson back to find out where he got the idea of 5 and 15 mph speed restrictions on Point No Point Road but he didn’t reply. The in basket: Morris 2126, who didn’t leave his last name but who evidently is 2,126th in a succession, wrote, “I have observed many large pickup trucks driving in Kitsap County with huge flags trailing from the beds. The American flag is frequently billowing in the wind. I assume that this signals that the driver is charging into battle. “On more than one occasion, I have observed a large Confederate flag as well. I cringe every time I see the Confederate flag side by side with the Stars and Stripes. What is this supposed to signal? I seriously doubt the excuse of ‘southern pride.’ Get real, we all know what it really means. “While we cannot change stupidity and hate, I question whether it is legal to be driving around with large flags flying on our cars. It is a distraction. If the flag pole were to break, a serious accident could occur,” he said.. The out basket: I see more 12th Man flags that answer that description than either American or Confederate flags. The in basket: Richard Yerk of Suquamish called to say those who are aware of the new bridge Kitsap County built on Orseth Road this year have taken to calling it the Orseth Narrows Bridge, due to its size and complexity. They are non-plussed by what they understand is the $1.3 million cost of a bridge serving the dead-end Orseth Road, which intersects Miller Bay Road near Indianola, can’t be much more than a quarter-mile long and has little development aside from the business at the end where Richard gets his landscaping supplies. The out basket: l went to look at the new bridge, and can’t say it’s all that excessive. Sheet pile walls that support the bank of the marshy area beneath were the most unusual elements I saw. What struck me odd was the nature of that water. 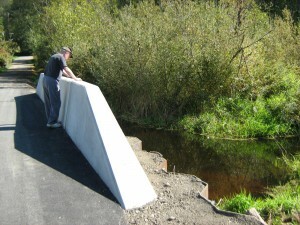 I assumed the work was one of the salmon-enhancement projects that increasingly use up the state and county’s road-building money. But rather than a stream, the water looked more like a marsh. There seemed to be no movement of the water which shows no obvious inlet or outlet and is surrounded by wetland growth. Tina Nelson, senior program manager for Kitsap County Public Works, says it is indeed part of a stream, Grover’s Creek, which is more obviously a stream elsewhere along its course. And the bridge cost $650,000, of which $450,000 went into the actual construction, not $1.3 million, she said. “Orseth Road is a county road classified as ‘Rural Local Access,’ she continued. “As such, it is incumbent on the county to maintain this roadway even though it provides access for only a limited number of properties. “As part of Kitsap County’s routine maintenance operations, the condition of existing culverts is periodically inspected to determine if improvements/replacement are warranted. A number of years ago, during a routine inspection, the six-foot diameter, corrugated metal culvert under Orseth Road showed heavy corrosion throughout the pipe. “To preclude any potential roadway damage (or complete failure) a project to replace the culvert was placed on the county’s 2008 Transportation Improvement Plan. “During the preliminary engineering phase for this culvert replacement project, various permitting agencies were contacted to determine the regulatory requirements for this environmentally sensitive site. (It) is mapped as having the potential for endangered fish presence and critical fish habitat, therefore fisheries design requirements for a replacement structure would need to be met. The regulatory agencies indicated that an 18-foot wide opening would be required to pass Grover’s Creek to the south. “Because of this large opening requirement, the idea of retrofitting the existing culvert with a liner or replacing the pipe in kind were not viable solutions. “Various larger culvert types and bridges were then analyzed and evaluated to determine the best replacement solution. From these alternatives, it was determined that a pile supported, precast, short span bridge would be the best and most economical replacement structure. “With construction of the short span bridge now completed, the roadway is preserved and fish passage is greatly improved at a much lower cost than was indicated to you,” she said.